The Dyck Arboretum of the Plains in Hesston offers visitors the rare opportunity to experience the wildflowers of the Great Plains in cultivation. The Arboretum features more than 1,000 varieties of native and adaptable trees, shrubs, wildflowers and grasses, presenting gardeners with a lexicon of native plant gardening possibilities. The staff includes some of the area&apos;s foremost authorities on native plants. The spring 2015 FloraKansas: The Great Plains Plant Bazaar will be April 24-27. 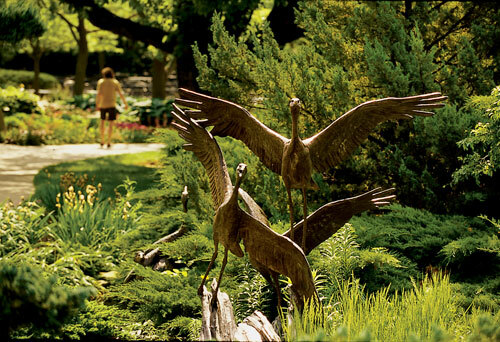 The 300-acre Overland Park Arboretum and Botanical Gardens may be the region&apos;s secret garden. It&apos;s an educational, recreational and cultural resource that showcases the seasonal splendor of hybrid trees and shrubs native to the area, with everything from wildflowers draping the hillsides to the fiery hues of sumac and persimmon. Visitors enjoy nearly five miles of paved and wood-chip hiking trails across two 75-foot bridges that span Wolf Creek. The Arboretum Sculpture Garden features 30 permanent sculptures. The Arboretum Café provides snacks, sandwiches and drinks daily until 5 p.m. Be sure to check out the garden inspired by Monet&apos;s water lily pond and bridge. The Parsons Arboretum is a 22-acre nature center with wetlands, walking trails, a picnic area, a visitors center and an 18-hole disc golf course. It also offers a playground, tennis, swimming and train rides in a beautiful forest setting. What&apos;s more, the site hosts festivals and concerts. Open year-round from sunrise to sunset. The Kansas Landscape Arboretum in Wakefield offers 193 acres and about 1,000 species of native and exotic woody plants adapted to the Kansas environment. Much of the area is still in native vegetation. There are also four short trails, prairie meadows and a pond on the Bird Sanctuary Trail where visitors can spot wood ducks, widgeon or green herons. Deer can often be seen emerging midday from the wooded areas. The causeway over the north end of the reservoir is a good place to see flocks of white pelicans in summer and fall, as well as many other migratory birds when they&apos;re on the move. Open during daylight hours with free admission. Birders, bring your binoculars! One of Kansas&apos; best-kept secrets is nestled in the heart of Wichita. Botanica, The Wichita Gardens are a regional horticultural center and a rejuvenating respite from the noise and flurry of daily life. This breathtaking destination offers more than 17 acres of great landscaping ideas and many different gardens to explore. If you wear perfume when you visit the Butterfly Garden and the Butterfly/Pansy House, you may get lucky and have one of the delicate creatures land on you. The Downing Children&apos;s Garden is a delightful wonderland for all ages. And be sure to check out the Chinese Garden of Friendship, new as of April 2015 and a unique Chinese garden in the United States. Join the visitors who come back again and again and see the gardens change continually across the seasons.